Love this Canadian Builder on the West Coast. Check out this tour. 230sq ft. I love the raised floor for the living room. The storage ideas are noted. I would like to use something like that in my tiny home. Such a great builder. Could you live in one of these? This tiny house is adorable and efficient. It will work well either as a backyard office or writing studio separate from the house, or as a home for one person who wants to live small.The beauty of this design is its versatility. All specifications can be built to suit.Check out our video below! This house could be finished off nicely by adding a high-efficiency propane furnace, a deck, and some more custom furniture. Nelson Tiny Houses is a locally-owned, sustainably-produced company that builds superior tiny houses. As builders and designers, we are inspired by the mountains, forests, lakes and culture of this special part of southern British Columbia. As such, we view building tiny houses as a place where science meets art, where trade meets craft, where a shelter becomes a home. Whether you are an existing homeowner looking to create a guest house, extra bedroom, office or rental opportunity, or new to owning your own home and looking to find a way that just makes sense, you have come to the right place. Tiny houses are bigger than they appear: they are a political movement, they are a work of art, they are a place to call home. 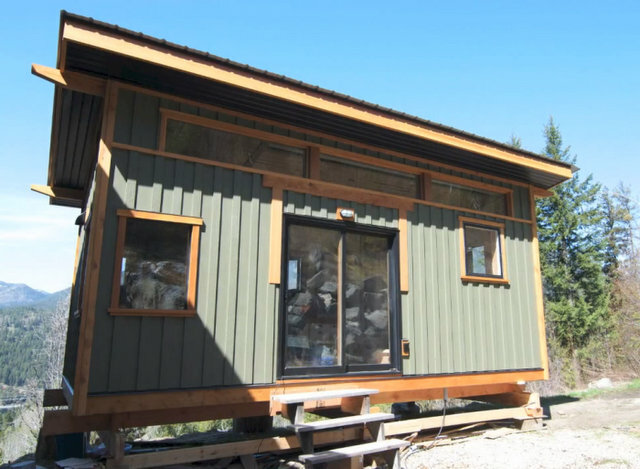 Nelson Tiny Houses: Bigger than just a place to live. You can view some images of the inside from Tiny House Swoon.